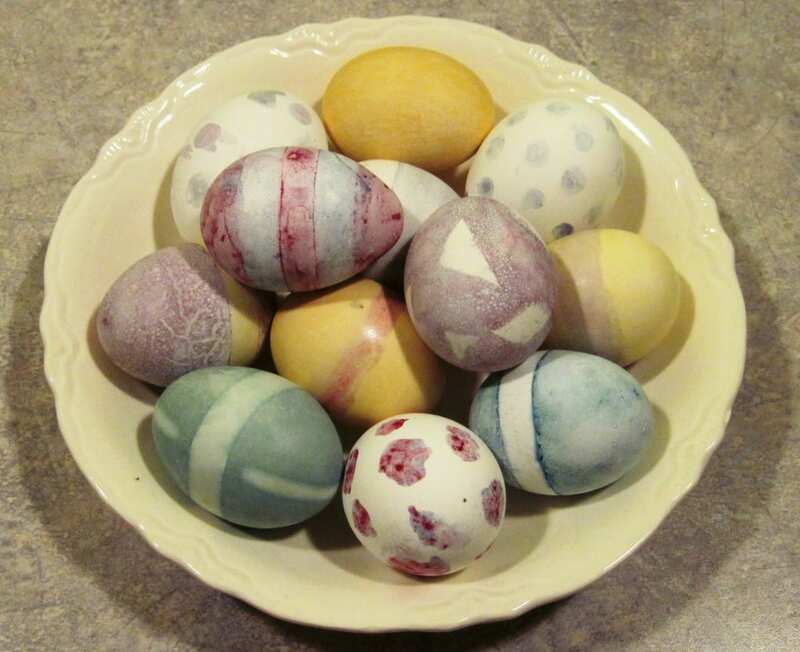 This year the boys and I experimented with natural Easter eggs dyes and ended up with the eggs shown above. Back in 2004, my sister, my mom and I had an Easter themed meal published in Taste of Home magazine featuring these Easter brunch recipes. I've been hunting around on my hard drive for the article we submitted, but I suspect it didn't get transferred when we switched computers a few years back. Luckily, though the magic of the internet, I can still find the recipes at the Taste of Home website and don't have to retype them all. The main theme of the meal was Easter bonnets, and there were two salads decorated to look like bonnets to decorate the table. 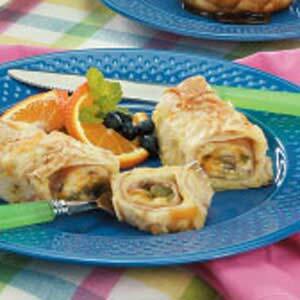 Along with the salads we served Spring-Ahead Brunch Bake and Caramel-Pecan Cinnamon rolls. In a large skillet, saute the mushrooms, onions and green pepper in butter until tender; set aside. Place one slice of ham on each tortilla. Top each with about 1/4 cup mushroom mixture. Combine cheeses; set aside 1/4 cup. Sprinkle remaining cheese over tortillas. Roll up tortillas. Place seam side down in a greased 11-in. x 7-in. baking dish. In a large bowl, beat the flour, eggs, milk, garlic powder, salt and hot pepper sauce until blended. Pour over tortillas. Sprinkle with reserved cheese. Cover and refrigerate for at least 30 minutes. Bake, uncovered, at 350° for 35-45 minutes or set. Yield: 8 servings. In a large saucepan, combine the sugar, gelatin and salt. Whisk in milk and egg yolks. Let stand for 1 minute. Bring to a boil over medium heat; cook and stir for 12 minutes or until mixture is thick enough to coat a metal spoon. Remove from the heat. Cool quickly by placing pan in a bowl of ice water; stir for 2 minutes. Stir in vanilla. Transfer to a large bowl; press plastic wrap onto surface. Refrigerate for 1 to 1-1/2 hours or until thickened, but not set. Fold in whipped cream. Transfer to a 9-in. round pan lined with plastic wrap and coated with cooking spray. Cover and refrigerate until firm. Invert onto a serving platter; remove plastic wrap. Cut fruit roll-up into strips with a width equal to the height of the Bavarian cream. Wrap fruit roll strips around bonnet and tie into a bowl. 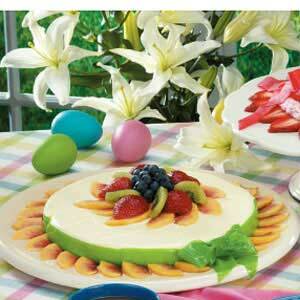 Garnish with fruit. Yield: 8 servings. I hope you and your family have a joyous Easter. Don't forget to check out the cute little Easter bunnies and chicks made from hard boiled eggs that are already peeled, so there's no mess at the table. Great recipes! I'm going to try them..thanks for sharing! Andrea – thanks! I hope you and your family enjoy them.